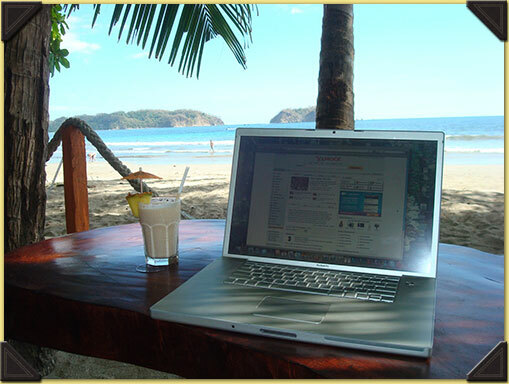 Picture this office… Wonderful views across the ocean, not a paperclip, stapler or Tippex stain in sight. Just a stylish laptop that’s a joy to touch. No filing cabinets so the office is spacious and open with a cool breeze and cherubs singing to you as you work. 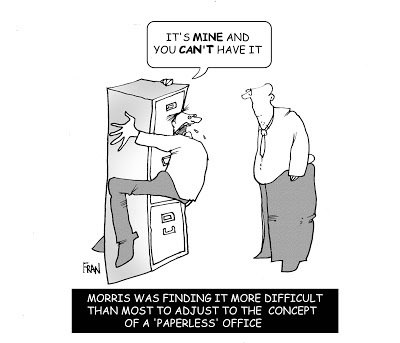 OK, so the cherubs are unlikely but the rest has often been held up as the nirvana of the ‘Paperless’ office. Ever since the early seventies businesses have been dreaming of having a slick and efficient paperless office. Business Week talked about it in a 1975 article. But very few of us have seen this wonderful transformation take place. For many of us mountains of paper and rows of filing cabinets are still the reality. Although paper won’t be disappearing from our working lives anytime soon, we can get rid of it as quickly as possible. This gives us the room we need to make our working spaces more comfortable, efficient and spacious. This simply requires a business to have a structured approach to scanning documents and storing paper somewhere it doesn’t clog up the office. Not only does the removal and scanning of documents mean you have more space to utilise but it also means you are not tied to the physical office itself. You can electronically access the scanned documents on your laptop or smartphone from anywhere in the world. Also if the paper is stored in a box somewhere you should be able to have someone find it, scan it and email it to you within an hour or two. Which means you could be ‘in the office’ while on the beach, in the garden or wherever you wish.